The 'Ode to the Red Cliff' theme is derived from an essay written by the famous Song dynasty poet, Su Shi (1036-1101). The text was inspired by Su's visits along the Yangzi River and to a particular site where a famous battle took place during the twilight era of the Han dynasty in 208 AD. The first Ode discusses the shortness of life and joys that could be had along the river; and the 'Latter Ode' describes hiking along the rocks with friends, drifting along the river on a boat and permitting the current to take the boat's direction. 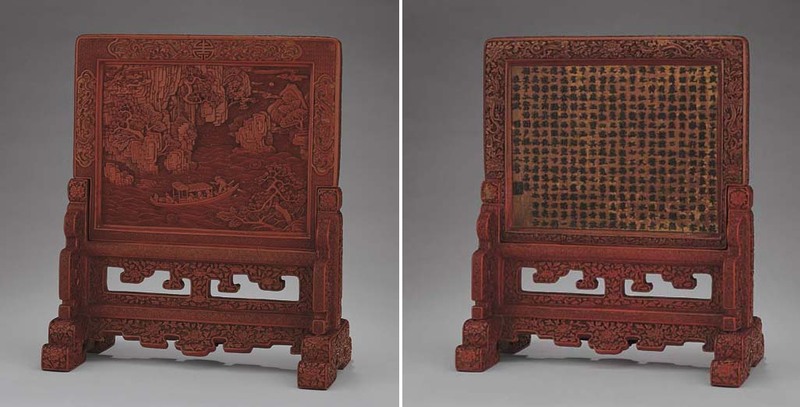 The boating scene appear to be a popular decorative theme during subsequent Ming and Qing dynasties, and applied to a variety of media such as ceramics, bamboo and lacquer. Cf. a larger lacquer screen carved with a similar scene of the 'Ode to the Red Cliff', illustrated in the Special Exhibition Catalogue of Lacquer in the National Palace Museum, Taiwan, 1981, pl. 64.